Angie Dunbar-Bonnie played for our U13 Clarets Girls during the 2014-15 season having been spotted playing school football by one of our managers, Steve Davidson. She was hugely influential as the team swept to a BGFL League and Cup double. At the end of the season we encouraged her to trial for The Middlesex FA Centre of Excellence. She was successful and spent 2015-16 there. When the centre closed at the end of the season she gained a place with Chelsea’s Centre. 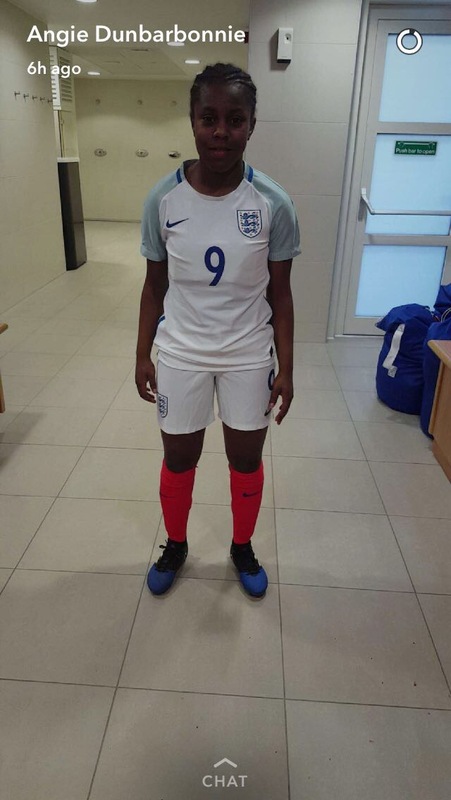 In February this year Angie was selected for the England Women’s U15s camp at St. George’s Park and was due to play against Germany. She is pictured here in her England KIT. Unfortunately due to storm ‘Doris’ the fixture was unable to go ahead.